Our Creamed Brussels Sprouts with Bacon is rich, cheesy and delicious. 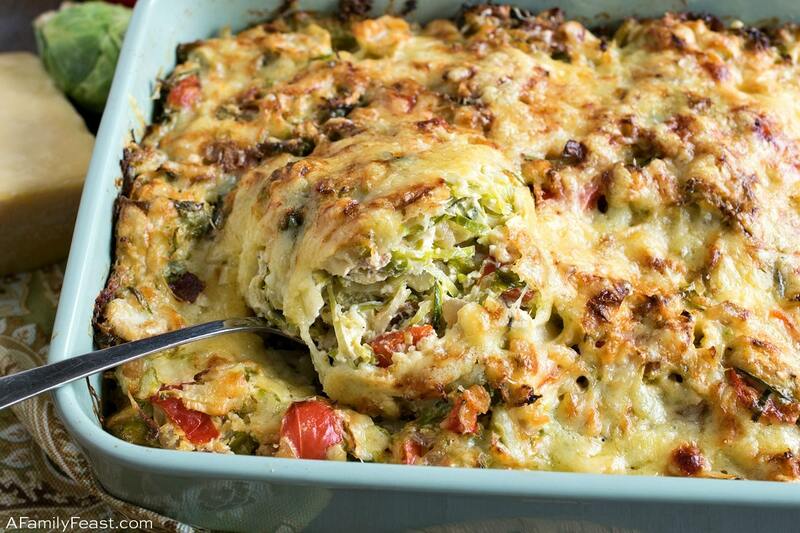 Still searching for the perfect side dish for your Easter dinner? 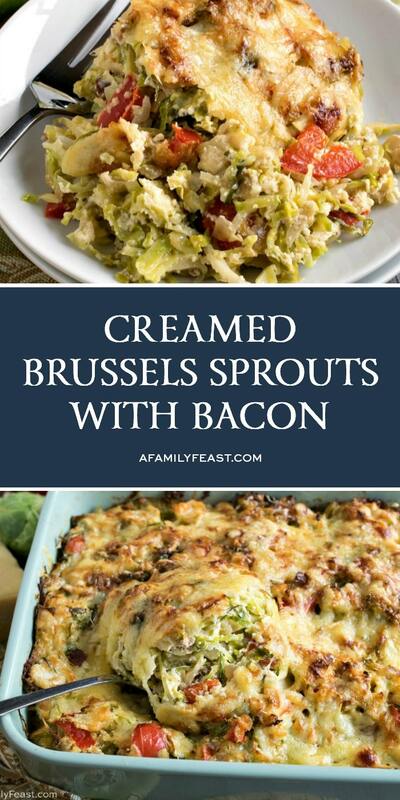 Give our Creamed Brussels Sprouts with Bacon a try! 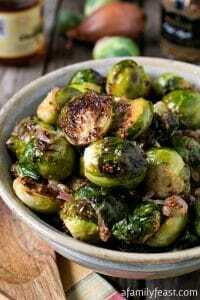 With three flavorful cheeses (Gruyere Swiss, Boursin and Parmesan), as well as crispy bacon, plus bell peppers, red onion, and garlic, this bold Brussels sprouts side dish is equally fantastic with our sweet and spicy Perfect Holiday Ham, or our Roasted Boneless Lamb with Red Wine Sauce. How do you make Creamed Brussels Sprouts with Bacon? 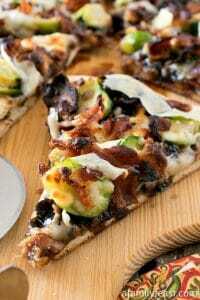 Then sauté bacon, onions, red bell peppers, and garlic in a skillet – then add in your sliced Brussels Sprouts. Next, you’ll combine shredded Gruyere cheese, with the Boursin cheese, sour cream, mayonnaise and eggs. 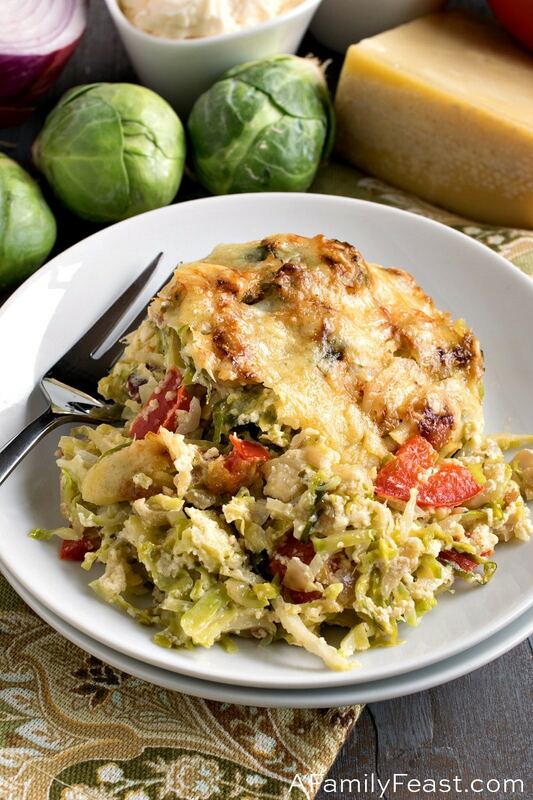 Then you’ll add this cheesy mixture to the hot skillet with the sautéed vegetables. 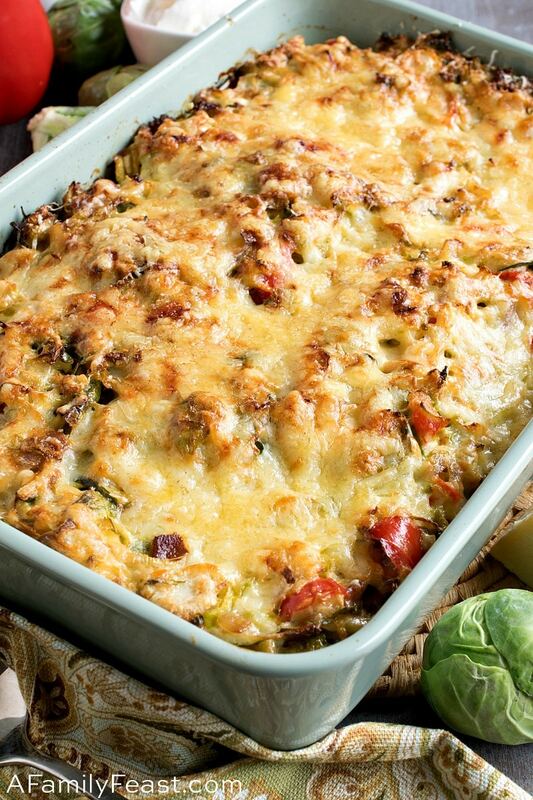 Once combined, pour into a baking dish and top with Parmesan cheese and more Gruyere. Bake for about 30 minutes. The top of your Creamed Brussels Sprouts with Bacon will become nice and golden, while the inside becomes hot and melty. 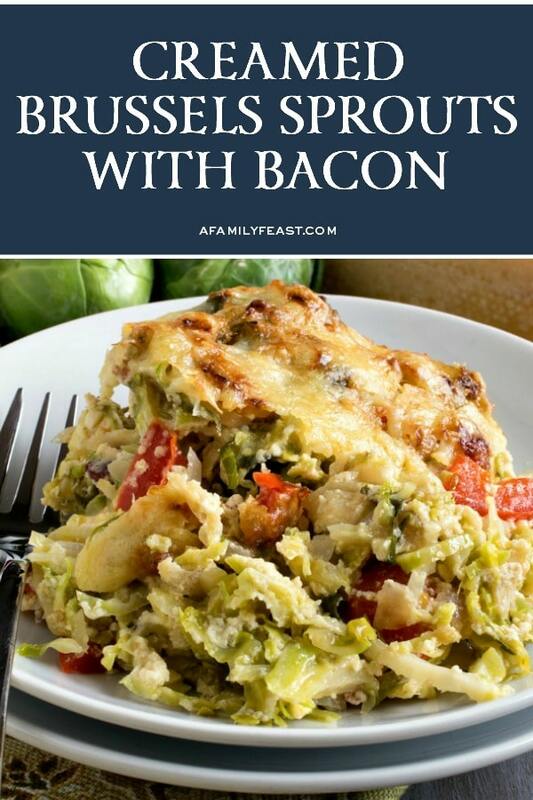 Can I substitute other cheeses in my Creamed Brussels Sprouts with Bacon? You can of course…but I wouldn’t recommend it! 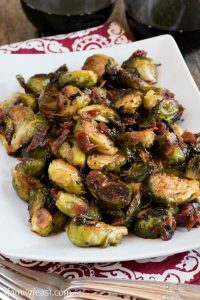 The rich, nutty Gruyere, the herbaceous, garlicky flavors of the Boursin, and the sweet, nutty Parmesan cheese are really a perfect flavor combination for the Brussels sprouts and salty bacon. 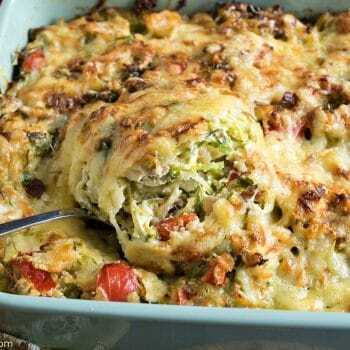 Additionally, if you can specifically use Gruyere Swiss versus just plain Swiss cheese – that will really make a huge flavor difference in this dish. What is Gruyere vs Swiss Cheese? Both Gruyere and Swiss Cheese come from Switzerland, and they are a hole-filled ‘Emmental style’ of cheese which is most commonly referred to as Swiss cheese. This style of cheese dates back to the 12th century, where it was named after the canton of Berne’s Emme Valley in Switzerland. Using a mandolin, slice Brussels sprouts into one quarter inch slices. Leave root end on to make it easier to hold then discard the root after slicing. Use a protective guide. In a large skillet, heat oil over medium high heat and add bacon and cook to just short of crisp, 3-5 minutes. Add red onion, red bell pepper and garlic and saute three minutes. 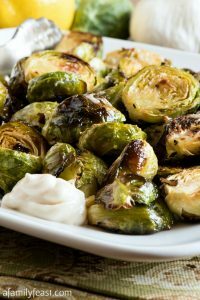 Add sliced Brussels sprouts, salt and pepper and cook just until they are no longer raw but not cooked, about three minutes. While vegetables are cooking, in a medium bowl mix half the shredded Gruyere swiss with the Boursin cheese, sour cream, mayonnaise and eggs. 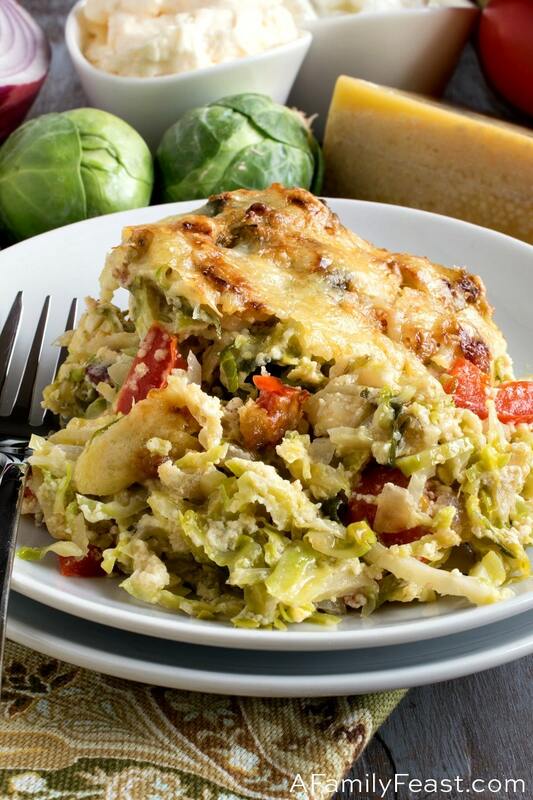 Remove the pan with the Brussels sprouts mixture from the heat, and stir in the cheese mixture then pour into a 9×13-inch oven safe dish or pan. Sprinkle on the Parmesan and remaining Swiss and bake uncovered for 30 minutes.